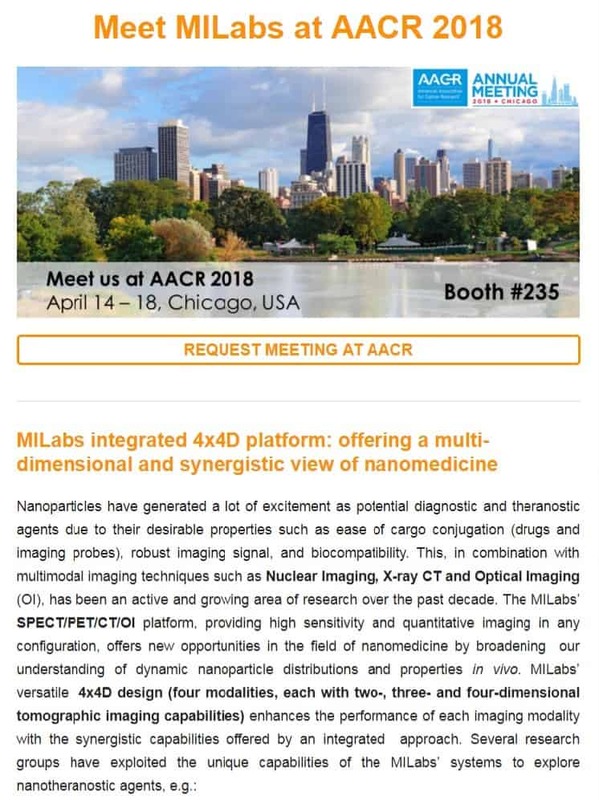 Exciting nanomedicine discoveries are possible with MILabs 4x4D imaging. Dynamic biodistribution and accumulation of nanoparticles in vivo: the pharmacokinetic profile and biodistribution of radiolabeled nanoparticles was visualized and 4D quantified with MILabs’ SPECT/CT imaging platform, showing superior sensitivity and resolution for characterizing tumor areas in mice as well as favorable biological half-life for translation into the clinic [1,2]. In a different study, the size- and time-dependent circulation half-life and accumulation of polymer nanocarriers were studied . In addition, the biokinetics of 111Indium-labelled micelles, as well as the impact of different morphologies on their cellular uptake were visualized using the MILabs’ imaging system. When compared with traditional ex vivo biodistribution studies, a multimodal imaging platform offers the possibility to determine the amount of circulating molecules longitudinally and provides dynamic measurements of localized blood and tumor concentration changes over time . A) Spherical polystyrene micelle, B) Maximum intensity projections of follow-up SPECT/CT mouse scans at 0, 24, and 48 hours post-injection of 111In-labelled micelles and, C) quantified uptake of the 111In-labelled micelles in multiple organs of interest. Image adapted from . Novel CT contrast agents: high-performance CT imaging was used to characterize newly developed biodegradable iodine-rich nanopolymersomes and their use as superior contrast agents to commercial iodinated small molecules currently used in the clinic. The nanopolymersomes have demonstrated several advantages such as excellent stability, small size, high iodine content, and ability to carry tumor-associated peptides which renders these agents as a truly multifunctional system for emerging multimodality nanotheranostics . The versatility of such novel contrast agents can now be enhanced by MILabs’ dynamic dual-energy CT, greatly improving soft-tissue contrast. Drug delivery: several therapeutic agents are efficient not only when targeting abnormal cells, but also when reaching subcellular compartments. Modular nanotransporters were used to achieve delivery of an Auger electron emitter, 111In, to the nuclei of target cancer cells. Even though it has been widely used as an imaging agent, no therapeutic agent based on 111In has yet been developed mainly due to the necessity of its nuclear delivery for efficient cell killing. To this end, the newly synthesized agent was successfully visualized using U-SPECT/CT, showing excellent specificity towards the target of interest . Gold-coated lanthanide phosphate nanoparticles, conjugated to antibodies and labeled with a beta-emitting isotope 177Lu, were also reported to target metastatic cancer in lungs . By using nanoparticles that contain beta emitters, the authors were able to tailor the treatment of metastatic disease with longer range lower linear-energy transfer radiation, improving the delivery of localized therapy in a more efficient manner. In addition to the nuclear imaging modalities, a large and expanding number of such prototypic nanocarrier materials can now be characterized easily with the recently launched MILabs’ hybrid OI/CT platform, capable of 3D fluorescence tomography (FLT) and bioluminescence tomography (BLT) in a highly sensitive and quantitative manner. 1. Biodegradable Nanoagents with Short Biological Half-Life for SPECT/PAI/MRI Multimodality Imaging and PTT Therapy of Tumors. L. Chen, J. Chen, S. Qiu, L. Wen, Y. Wu, Y. Hou, Y. Wang, J. Zeng, Y. Feng, Z. Li, H. Shan, and M. Gao. Small, 2018. 2. Bottom-Up Preparation of Uniform Ultrathin Rhenium Disulfide Nanosheets for Image-Guided Photothermal Radiotherapy. S. Shen, Y. Chao, Z. Dong, G. Wang, X. Yi, G. Song, K. Yang, Z. Liu, and L. Cheng. Advanced Functional Materials, 2017. 3. Quantitative SPECT imaging and biodistribution point to molecular weight independent tumor uptake for some long-circulating polymer nanocarriers. V. Schmitt, C. Rodrıguez-Rodrıguez, J.L. Hamilton, R. A. Shenoi, P. Schaffer, V. Sossi, J. N. Kizhakkedathu, K. Saatchi and U. O. Hafeli, RSC Advances, 2018. 4. In vivo biodistribution of stable spherical and filamentous micelles probed by high-sensitivity SPECT. L. Jennings, O. Ivashchenko, I. J. C. Marsman, A. C. Laan, A. G. Denkova, G. Waton, F.J. Beekman, F. Schosseler and E.Mendes, Biomater. Sci., 2016. 5. Nanopolymersomes with an Ultrahigh Iodine Content for High-Performance X-Ray Computed Tomography Imaging In Vivo. Y. Zou, Y. Wei, G. Wang, F. Meng, M. Gao, G. Storm, and Z. Zhong. Advanced Materials, 2017. 6. Development and evaluation of a new modular nanotransporter for drug delivery into nuclei of pathological cells expressing folate receptors. T.A. Slastnikova, A.A. Rosenkranz, Y.V. Khramtsov, T.S. Karyagina, S.A. Ovechko, A.S. Sobolev. Drug Design, Development and Therapy, 2017. 7. Synthesis and targeting of gold-coated 177Lu-containing lanthanide phosphate nanoparticles—A potential theranostic agent for pulmonary metastatic disease. N. Sobol, L. Sutherlin,E. Cedrowska,J. Schorp, C. Rodrıguez-Rodrıguez, V. Sossi, J. Lattimer, D.C. Miller, P. Pevsner, and J.D. Robertson, APL Bioengineering, 2017.